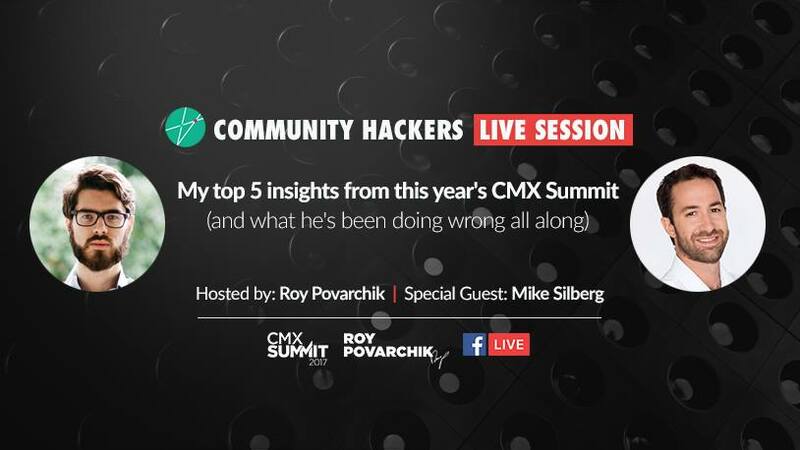 If you’re a community manager and have yet to hear about CMX Summit, you’re in a for a treat. For already avid fans – get ready to upgrade your community management skills. Organize and equip a global movement of community professionals, in order to shape a more connected, collaborative and compassionate world. They do workshops, conferences, community and professional training. I advise you to check their website or their super-valuable Facebook group. Last September, CMX hosted their event packed summit in LA. Mike Silberg, Community director at Brooks-Keret, and a member at ‘Community hackers‘, attended the event in person. Mike came back excited with insights and tons of information he wanted to share. As always, I took the opportunity to grill him with questions In a special Facebook Live session (For the ‘Community Hackers’ audience) about his personal takeaways. We talk about his top 5 favorite talks and what he learned he was doing wrong all along as a community manager. Want to get Mike’s conference summary notes? As promised there’s a bonus we’ve made just for you. If you’ve watched the video, you’re probably tired of trying to take notes and summarize all of Mike’s amazing insights. So we wanted to give you something extra for your time, effort and curiosity. We’ve gathered all of Mike’s conference notes and materials he has gathered during the summit – in a downloadable file you can get here – for free. Simply Enter your email below, and you’ll get all Mike’s notes and conference material he collected right to your inbox! Are you a community manager for a startup? Write down your biggest challenge below in the comments and I promise we will address them in future blog posts.